What are the origins of the 'LOVE' design? The "LOVE" design is ubiquitous in Philadelphia; truly, pedestrians can hardly round a corner in Old City without spotting one in a window. But where exactly did it come from? Curious, we reached out to Gerald Silk, professor of modern and contemporary art at the Tyler School of Art at Temple University, for an explanation. Who made the LOVE sculpture? What inspired it? The artist is Robert Indiana, who is still alive at 89 and lives in Maine. I might mention that “Indiana” was not his birth name. He chose this pseudonym as an artist: It’s the name of the state in which he was born and where his father had a Philips 66 gas station. The artist adopted it, in part, because of its appearance on road signs. In a world where, he said, “signs were more profuse than trees,” he appropriated their shape, colors, lettering and numerals for his visually arresting art that is symbolic of extended, often political, social, and autobiographical information. “LOVE” grew out of a Christmas card that he was asked to design for the Museum of Modern Art gift store. He had already used the design itself in a poem that he had written in the 1950s. He also made paintings based on the phrase “Love is God.” “Love is God” was inspired by Christian Science churches that were conventionally devoid of works of art containing religious imagery, and he liked the purity and simplicity of this idea. Indiana was struck by this signage on such churches wherever he encountered them and this probably further encouraged his working with words and letters and formats derived from signage. The "Love is God" painting was done for a collector who didn’t have any of Indiana’s work in his collection and who was opening up a museum in a former Christian Science church. Indiana had also done some typesetting for a clergyman who was naturally preoccupied with the concept of Christian love. Indiana said that all of the ideas came together, reminding us that the origins of the work initially came from the spiritual realm. Indiana liked working in visually economical ways, which explains its square design and the need to quarter and stack the letters. He had also done an earlier painting containing the word “love,” above which he piled four stars, an inspiration for the "LOVE" works based principally on the letters. While working on "LOVE" in 1965, Indiana’s father died, and the artist chose the colors of “Hoosier” – blue sky and the red and green Phillips 66 logo as an homage. • Pop artist Robert Indiana designed the "LOVE" piece. It derived from a Christmas card he designed for the Museum of Modern Art's gift store in New York. • The design of "LOVE" also has spiritual influences, but ultimately found a place in Philadelphia because of its themes of openness and inclusion--Quaker virtues. • The statue came to the park as part of the Bicentennial celebration in 1976. • The design caught on like wildfire, even being transformed into President Obama's "HOPE" logo for his 2008 campaign. But, because he never copyrighted the design, his benefits from the work were fairly modest. • Indiana is still alive and lives in Maine. The general design--that pop-art look--has been adopted elsewhere, right? Did that originate with this design? Indiana is an important figure in pop, though less famous than, say, Andy Warhol and Roy Lichtenstein. Pop Art refers to work that corresponded to the tremendous growth in popular culture and mass media, fueled by prosperity in the United States in the post-World War II years, which became especially virulent in the 1960s. Pop addressed themes from American consumer and technological culture, such as its celebrity, violence and materialism, often rendered in ways influenced by mass media—comic strips, packaging, newspapers, advertising, television, street signs and billboards—and it is not usual to find text derived from these sources incorporated into pop art. It would be overstating it to attribute to Indiana and to his “LOVE” pieces the inspirational look of pop as a whole. But the “LOVE” work, appearing in many forms, including paintings, posters, sculpture and even a U.S. postage stamp, might well be thought of as emblematic of the 1960s “love generation,” “free love movement” and slogans like “make love, not war.” Of the pop artists, Indiana, however, may be the one most often is interested in having words function as a salient element. How did this statue and its design ultimately tie into Philadelphia? How did it end up in the park? 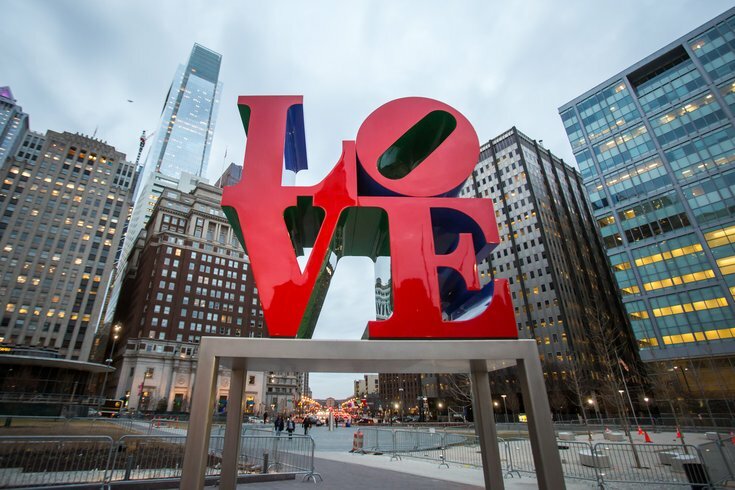 “LOVE” works, including sculptures, were made before this piece for Philadelphia. It does fit the “City of Brotherly Love” motto. It was also a Bicentennial commission, as was the nearby "Clothespin," by Claes Oldenburg, an artist associated with pop. What’s interesting to me is that Oldenburg’s "Clothespin" references a famous work in the Philadelphia Museum of Art, Constantin Brancusi’s sculpture, "The Kiss." A unique feature of the Brancusi is the equality between the sexes, somewhat rare in representations of heterosexual love up until that time in the history of art. "Clothespin," too, might be viewed as alluding to embracing lovers in which neither figure or gender dominates. In this respect, "Clothespin" and "LOVE," both challenge more conventional representations of love and declare an idea of “free love,” building upon and altering the American idea of freedom that the Bicentennial celebrates. The 1970s, when these both were installed, was a time of increasing feminist and gay-rights activism and perhaps these works speak to this. Also, the location of "LOVE" aligns with the Benjamin Franklin Parkway as the thoroughfare that links the civic and the cultural in Philadelphia, with the Parkway itself now in the midst of centennial celebrations. Oldenburg returned to the theme of freedom with his Philadelphia "Paint Torch," at the Pennsylvania Academy of Fine Arts, which connects the statute of liberty to art production. What do you think it is about the "LOVE" design that made it stand out and catch on as well as it did? What was Philly's first theater? Part of what makes this work so compelling is that by using the word “LOVE,” rather than making say, something figural, to represent love, it becomes more open-ended. It can be about spiritual love, as Indiana notes, but it also can refer to all types of love. Indiana is gay, and since this image doesn’t depict heterosexual love--or any physical act--in any specific way, he may well be arguing for openness to all types of love. It doesn’t show two figures but rather four letters, which also encourages openness. As I mentioned, Philadelphia is the City of Brotherly Love, and Indiana may also be thinking about this broader Quaker concept of tolerance and equality. It is also visually arresting in its square arrangement, stacked letters and intense colors, and people – no doubt – have responded to its more potentially wide-ranging, universal, and tolerant expression of the concept of love. Has the artist done any other notable works? Absolutely. He had major works shown at the 1964 World’s Fair in New York. His MECCA arena is well-known. Much of his work intermingles broad social and political issues and autobiography. He has had made key pieces based on the railroad crossing “X” that references Route 66, America’s consumerism, violence and quest for love, as well as dying words spoken by his mother. He did a famous series of works based on the art of Charles DeMuth, an early twentieth-century American modernist, who too was gay, which was ultimately inspired by the poetry of William Carlos Williams, a Camden, N.J., physician and poet. Any fun facts you'd like to add? Some have suggested that "LOVE," in a disguised fashion, references his relationship with the minimal, color-field, hard-edged artist Ellsworth Kelly, whose work is well represented in the PMA, partly based on the colors used. The “LOVE” arrangement has been translated into others languages, and the “AMOR” version has been displayed in Philadelphia. It also was adopted for the word “HOPE,” and Indiana sold versions of it to support the Obama presidential campaign for the presidency, raising in excess of $1 million. “LOVE” brought him great fame, but since it was never copyrighted, many others have benefited from it. He’s an important artist who has made strong work throughout his career, which has been overshadowed by the fame of “LOVE.” Some say that he retreated to Maine to remove himself from the spotlight.